The curve isn’t extended out, but it’s a polynomial, and we know what happens: it’s going to intersect the X-axis. 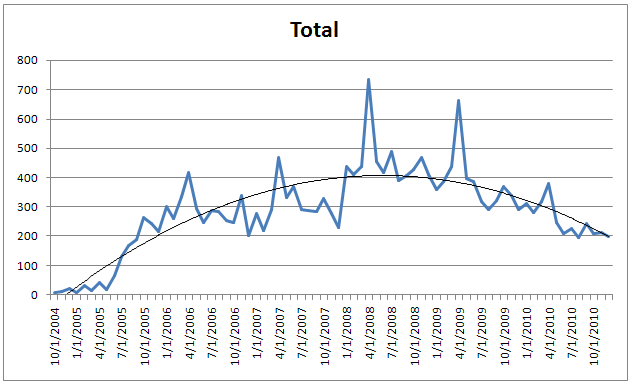 I didn’t do the math, but if you want to, you can predict, to the day, when blogging as we know it will cease. I couldn’t help thinking: what else can we fit a curve to? The stock market?—no, that’s heavy stuff. How about the hours of daylight this year? There can’t be any harm in that, can there? So I went to an online hours-of-daylight calculator and got the sunrise and sunset times for the first 60 days of the year. 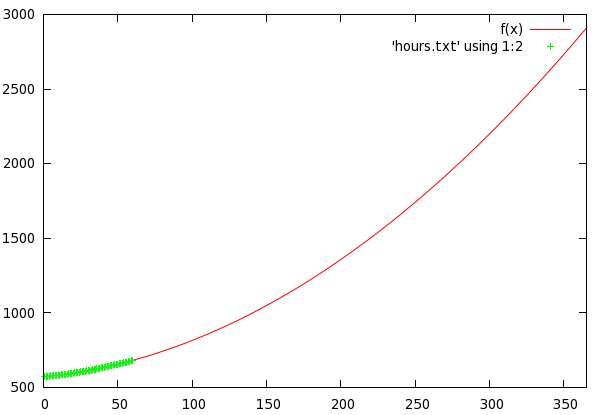 I plotted the result in gnuplot and fit a polynomial to it. The X-axis is the day of year, and the Y-axis is minutes of daylight. The conclusion is clear: by year’s end, the days will be 2909 minutes long. That’s more than 48 hours. The way things are going, we’re headed for negative sleep a little over halfway through the year. In case you’re worried about the quality of my analysis, stop. The curve is an excellent fit for the points, so you can’t argue with it; and I got my data from the US Navy, so there can’t be problems with that either. What are we going to do now?